A few years ago, I was lucky to spend some time with Lucy Aphramor while she was visiting New Zealand. We had a delightful time, and some interesting conversations around health, weight, and her work on Heath at Every Size. As a fat activist, I reject that any consideration of health should be part of the conversations about what rights and dignities fat people should receive. As a Fat Studies scholar, my work explores how the spoiled identity of fatness impacts on health and well-being. I often find myself working through the tensions between the two – both internally, when crafting my narratives and designing my research, and externally, when others hear me talking about health and assume that I’m promoting a version of healthism. The responsibility is on me, as an scholar and an activist, to ensure that I am not buying into or promoting oppression in the many facets of my work. The new book out from Lucy, and her co-author Linda Bacon, builds on both of their work to promote access to evidenced based healthcare for individuals of all sizes. It is a reader friendly text, designed for individuals who don’t have a background in science, or nutrition, or statistics, etc. It’s the kind of book that you can give your parent, or your friend, or anyone that you meet that might want to know more about divorcing ideas of about health from body weight. Many in my circle just might find themselves with a copy at Christmas. It’s an interesting thing, to read a book about bodies and body respect, that is written by two white thin individuals. There are many spots in the book where the intersection of those qualities is apparent. But I appreciate that both authors also acknowledge the privileges that they have, and I do believe that what they bring to the conversation is important. 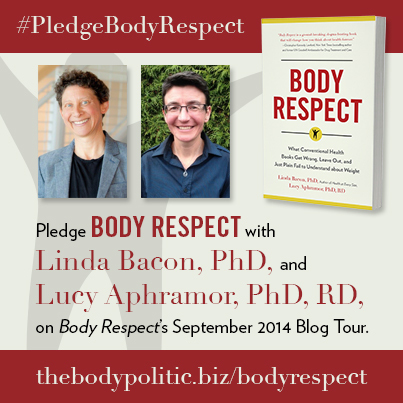 I was thrilled to be asked to be part of the #BodyRespect tour, and I decided to ask Linda & Lucy some questions about their work and the text. If you are interested in learning more about HAES, this book is a good place to start. We’d met up on several occasions and began to see that there was synergy in a joint book, one that would stem what we felt was a creeping tide of healthism through lack of awareness in HAES narratives. The book makes Lucy’s work more accessible and expands on what Linda covered in her HAES book presenting a short, accessible read that shows us how a new way of being in the world without shame, how to bring a ‘rights’ lens to wellbeing and how as health and social care practitioners we really can bridge self-care and social justice. Why do you think conventional books leave out this kind of information? The lifestyle change agenda streamlines so effortlessly with neo-liberal policies that it’s hard to find a fault line within it to think differently. So we’ve got this situation where dominant ideas across health, education, welfare, employment and so on, rely on and create the illusion of life as a level playing field where everyone can have it good if they only apply themselves and which totally disappears privilege and oppression. In the States, there is even an explicit name for this phenomenon, the “American Dream,” the idea being that everyone can achieve whatever they want, as long as they try hard enough. Then the individual gets blamed when they aren’t successful. It’s a breeding ground for blaming individuals who get so-called lifestyle diseases, like type 2 diabetes. In this way, high blood pressure in Black Americans and high prevalence of heart disease in UK South Asians get explained away through weight and diet without even a nod to the relevant research literature on racism. And when, as health practitioners, we’ve been taught not to question grand narratives for fear of being ostracized by our peers, threatened with reprisal by our professional organisations and so on, the culture doesn’t invite criticality. So too, an over-reliance on positivist science encourages us to ignore our emotional responses to patients’ distress as ‘not data’ and dismiss stories that don’t line up with what the science says as lies and non-compliance. How else could hundreds of thousands of weight loss appointments occur year in year out? The evidence is out there – but authors who have learnt to see ourselves and others as calorie burning machines and health as a function of weight and lifestyle are unlikely to think to look for it. What role does your own body size have in your work around body respect? Lucy: Being a thin dietitian is a strong motivator for me in working to advance body respect: my profession is scaffolded on a fat phobia that itself has with deep roots in somatophobia, or body shame, and having seen this it’s not an option to be complicit. I’m thin, white and middle-class, I can talk the language of the oppressor very eloquently which gives me a credibility with audiences for whom I epitomize the hegemonic aesthetic of health. I’ve found it very powerful to finish by asking folk how they would have heard me differently if I was fat. Say I’m presenting on critical weight science and most people seem on board with the intellectual arguments, there is a collective dawning of awareness of what’s really at stake when I ask the group to consider how far my embodiment has influenced their engagement. On a more personal note, I’m passionate about sharing what I’ve learnt about healing from body shame and disconnect because of how the journey transformed my life. As everyone familiar with Linda’s work will know she is likewise committed to keeping thin privilege in view. It’s the topic she chose to highlight when invited to give a key note presentation to the National Association to Advance Fat Acceptance and you can read her speech here: http://www.lindabacon.org/Bacon_ThinPrivilege080109.pdf. How can people interested in public health reach across the aisle without reinforcing healthism? And how can health providers incorporate these lessons into their practice; where would they start? Read the stories towards the end of book to see how our nurse practitioner Billie works with client Janet to support her in self-care while keeping a firm grasp on the lived realities of Janet’s life and the material and non-material impact this has on her health and opportunities to look after herself. You’ll see a public health agenda in action that opens up a way for us to be together in relationships of mutual respect that support people living with oppression in moving towards self-care because they do not disappear either hardship or dignity.